Fruit with late leaf rust. I (yes, it’s me, HerbDoc) had an interesting question from a beekeeper the other day and thought others might have the same problem. The beekeeper was looking for a control for late leaf rust which would not harm the pollinators in the garden. He indicated that his property also contained white spruce and that they had lost their entire crop of raspberries last year. Red raspberry leaf infected with late leaf rust. Late leaf rust is a fungus which is heteroecious, meaning that it attacks two different hosts at different stages of its life cycle. 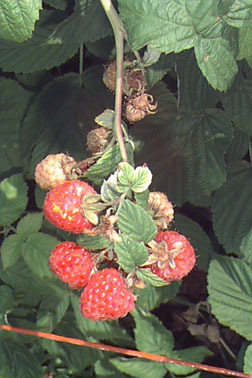 The rust fungus produces two types of spores only on red raspberries. The alternate host for the rust is white spruce on which the aeciospore is produced. These are released from infected white spruce in mid-June to early July and are capable of infecting the raspberries at that time. The spores start to form on the undersides of the infected raspberry leaves and flower parts. Another type of spore develops on the infected leaves and canes in the fall and serves as the overwintering form of the fungus. These develop the following year and infect the white spruce needles. New studies indicate that most of the fungus is overwintering on infected canes so it is wise to cut them down. All of the canes and anything that fell to the ground should be disposed of in the garbage that leaves the property. The best advice includes making sure the site has good air circulation and full sun exposure. A tree canopy can cause fungus problems. Row width should be 1-2 feet and cane density should not exceed 3-4 canes per square foot. Control fertilizer to prevent excessive growth and keep weeds under control. At the end of the season remove and destroy old fruited and infected canes. The only treatment that is considered organic is fixed copper (Bordeaux mixture – a mix of hydrated lime and copper sulfate). It would be applied in dormancy and at first bloom. Most farm supplies carry this product and Gardens Alive! Online carries what they call Soap-Shield which is copper-based and non-toxic to bees and other pollinators. Thanks for this info! I have a box outside my door (really need to unpack that thing) full of new raspberry canes – I hope. Good to know about this stuff – hopefully I won’t have to refer back to this post! I grew raspberries for years and never had a problem with them, Wendy. If I had a problem of this extent, the first thing I’d do is ditch the white spruce, but the homeowner wanted to keep them. Good luck! Raspberries are one of my favorite fruits, and they are absolutely delicious right off the canes! Hey guys. I would look for a copper hydroxide product like Kocide first before ever using a Bordeaux mix. Copper sulfate is much more “hot” than the hydroxide form. Do a test spray, but you shouldn’t need lime with Kocide. Also summer fruiting varieties should be done fruiting before rust becomes a problem. Much more of an issue on primocane bearers like Caroline (extremely susceptible). Thanks, Tom! I hadn’t heard of this product before but will keep an eye out for it in my local supply store and let my beekeeper friend know about it. He didn’t mention the variety of raspberry he was growing, but he did note that the entire crop was lost two years in a row to the fungus.